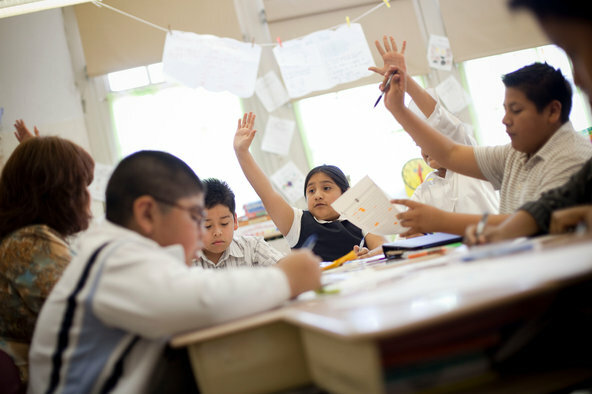 Michael Nagle for The New York Times – Students at P.S 172 in Sunset Park, Brooklyn, preparing for the state exams in 2010.April 16, 2012, 2:29 p.m.
By HITEN SAMTANI – Hiten Samtani is a student at the Columbia University Graduate School of Journalism and a SchoolBook intern. Follow him on Twitter @hitsamty. Article originally posted in the New York Times. While thousands of New York public school students will sit for mandated standardized tests this week, only a handful will be deliberately kept from picking up their No. 2 pencils to fill in the test sheet bubbles. That doesn’t mean more parents aren’t thinking about keeping their children home. In a show of protest against high-stakes testing that they say warps the curriculum, takes precious weeks away from substantive learning, and doesn’t measure a child’s true ability, some parents are opting to keep their children out of the tests this year. In New York and across the nation, they have been sharing information, discussing concerns about potential ramifications, and asking other parents and educators to join their cause. The rumbles of protest are resonating more strongly outside of New York, and organized efforts to push back against the trend of more student testing have taken hold in Texas and Seattle, and on the Internet. But even here, groups like Change the Stakes, which put out a news release on Monday reiterating their advocacy for opting out, are becoming more vocal. In New York, the federally mandated standardized math and English tests for third through eighth graders begin on Tuesday. Results from these tests play a major role in grade promotion, middle and high school applications, and placement into gifted and talented programs. Test scores are also used in teacher and school evaluations. For weeks, if not months, before the exams, many schools substitute test prep for projects and essays, and children are taught not just testing strategies but also such dubious skills as how to fill in the entire answer bubble or show all their work. Consequently, some parents are protesting the very act of testing, not to mention the high stakes application of the results. “Learning in our schools has become a matter of meeting static, arbitrary and superficial ‘standards’ rather than engaging in the dynamic, endlessly creative process of discovery that children come into the world eager to embark on,” said Jeff Nichols, a parent who said he will be keeping his third-grader out of this week’s tests. In March, along with his wife Anne Stone, Mr. Nichols, an associate professor of music at Queens College, wrote an open letter to parents in the public school system, inviting them to learn more about boycotting the test. Mr. Nichols and his wife have also written about their concerns about the tests for SchoolBook, in a post about E.B. White and the quality of some of the questions and another about how the exams may quash a love of reading. Robert Kulesz, a college administrator who has a son in third grade at a public school in Astoria, was one of the parents who responded to the open letter. He said he plans to keep his son out of school during the testing period because he feels the test has been “destructive” to the curriculum. “It’s like a cancer,” he said. “It takes away from all the other areas that are important to our kids, such as arts and physical education. In 2011, approximately 453,000 students in New York City district and charter schools took the English Language Arts test and 462,000 students took the math test, according to a spokeswoman from the Department of Education. More students took the math test, the spokeswoman said, because first-year English language learners are exempt from the English Language Arts exam. Comparatively, only 37 students in the city refused to take the math test, and 30 refused to take the English Language Arts test last year, officials said. It is unclear how many will opt out this year — and even some of those parents who say they are having their child opt out requested that their children’s schools not be named, fearing a backlash. Still, some parents said, concerns aside, they would have their child sit out the test. Diana Zavala, a speech therapist who used to teach in the public school system, said that she saw a marked difference in her son’s demeanor when he entered the third grade, which is the first year of testing. “My son was displaying a lot of anxiety, about school and about what his reading level was,” Ms. Zavala said. This increased stress on her son, she said, coupled with her concern that the curriculum suddenly abandoned creative instruction, made her decide to pull her son out. The Department of Education has no formal policy on students refusing to take the test, the spokeswoman said. But according to state and federal policy, schools are mandated to administer the test to all eligible students, and having students opt out is not considered an excuse for missing progress targets because participation rates fall below a certain threshold. Since the tests are so central to promotion, admission and evaluation decisions, it is unclear what the consequences of opting out are. In March, at a panel titled High-Stakes Testing 101, the city’s chief academic officer, Shael Polakow-Suransky, said he did not have a clear answer for students who missed the state test, but he suggested that an alternative assessment, such as a portfolio of schoolwork, could be used to demonstrate proficiency. The portfolio approach is already part of the appeal process for failing students. Mr. Nichols said he believes his son’s school will substitute a portfolio review for the test, to determine his eligibility for promotion to fourth grade. This portfolio will be created out of his son’s classroom work, which he feels is a much fairer way to evaluate a child’s standing. Janine Sopp, who is also keeping her third-grader out of the test, said that her daughter’s principal at the Brooklyn New School, Public School 146, told her that along with a portfolio, her daughter would have to do a reading comprehension test. While a portfolio, teacher recommendations and attendance could be used to make the ultimate decision on grade promotion, opting out could have serious ramifications, said Jane Hirschmann, founder of the Parents’ Coalition to End High Stakes Testing. “You can’t be sure in this atmosphere,” she said. Victoria Frye seriously considered having her son, a fourth-grader atP.S./I.S. 187 Hudson Cliffs in Manhattan, sit out this year’s tests, because she said the emphasis on test preparation takes away from his ability to work on longer, immersion projects that help him grow. But her son decided he wanted to take the exams. “We did have a conversation about it, and he’s actually one of these kids who loves tests,” she said. She said she had been worried about what opting out would mean for her son’s admission to middle school. The ripples of protest against high-stakes testing in New York City are part of a much larger nationwide wave. In Texas, more than 100 school districts recently passed a resolution saying standardized testing is “strangling” their schools. At a school in Seattle, more than 25 percent of children won’t be taking the tests at the end of April, the Seattle Times reports. Several Facebook groups and Web sites like the Bartleby Project andTime Out From Testing have sprung up to help connect parents and educators and provide state-specific tips on opting out. Timothy Slekar, an associate professor of teacher education at Penn State Altoona and one of the founders of United Opt Out, one of the more prominent Web sites, said data from these tests is being used to persuade the public to go along with what he describes as the corporate-driven reform movement. Opting out, he said, is a way to hit that movement where it hurts. “Without data, it can’t go forward,” he said. Although in his State of the Union address in January President Barack Obama called for an end to teaching to the test, many believe that the increased emphasis on testing is a direct consequence of his administration’s Race to the Top contest. Mr. Kulesz called the initiative “conceptually flawed.” “It suggests that there are winners and losers, which seems a really poor way to frame the notion of public education,” he said. The state standardized tests are administered over two weeks, largely in the mornings. Many parents of children who are opting out this year have planned educational activities for their children during the testing period, including intensive reading and museum visits. “We’re not going to treat it like a vacation,” Ms. Sopp said. Since her daughter is learning about Africa, she plans to take her to the Museum of the African Diaspora. Many parents also said that their child would attend school once the morning’s test sessions are over. But some parents won’t have the resources to take care of their children during testing time, and will have to leave them in school. Other parents said they have thought about opting out but haven’t done so yet — primarily because they are uncertain of what the consequences will be. But some parents said they are willing to take their chances. She said that she cannot subscribe to high-stakes testing because she doesn’t believe it’s an accurate assessment of who her daughter is. Bubble sheet?! Seriously- our schools in Utah -yes Utah-all tests are all online get into the 21st century people! We spend maybe a week not months reviewing. I think some off these parents are just crazy! Why is taking a cummulative test not a good indicator? If you don’t like public schools then homeschool your child. This entry was posted on April 17, 2012 by ClassroomStruggle in Action & Organizing.